Barilla&Acirc;&reg; Pronto&Acirc;&reg; is a delicious, one pan pasta that is ready from pan to plate in 10 minutes &acirc; no straining required! Barilla&Acirc;&reg; Pronto&Acirc;&reg; Penne is made with no preservatives and has the delicious taste and texture you can always expect from Italy&acirc;s #1 brand of pasta. BarillaÂ® ProntoÂ® is a delicious, one pan pasta that is ready from pan to plate in 10 minutes â no straining required! BarillaÂ® ProntoÂ® Penne is made with no preservatives and has the delicious taste and texture you can always expect from Italyâs #1 brand of pasta. Crafted with the highest quality ingredients, Pronto® Penne will maintain a perfectly "al dente" texture and delicious flavor without sticking or clumping. This unique pasta is prepared all in one pan – no straining required! Spend less time preparing your meal and more time enjoying it with Pronto®. Inspired by the shape of an old style pen that's great in pasta salads or chunkier sauces. Pair with Barilla® Marinara sauce, peas and cooked bacon for a delicious pasta meal in minutes. Ingredients: SEMOLINA (WHEAT), DURUM WHEAT FLOUR. VITAMINS/MINERALS: VITAMIN B3 (NIACIN), IRON (FERROUS SULFATE), VITAMIN B1 (THIAMINE MONONITRATE), VITAMIN B2 (RIBOFLAVIN), FOLIC ACID. 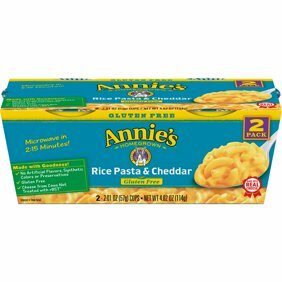 Instructions: *Reduced serving size preparation:Use a large 12" pan:Servings - pasta - water - stovetop heat.1 - 2 oz 1/6 of box - 2/3 cup - medium-high.2 - 4 oz 1/3 of box - 1 1/4 cups - medium-high.3 - 6 oz 1/2 of box - 1 1/2 cups - high.One pan dinner in 3 easy steps!You will need:1 large 12" non-stick pan + Barilla pronto + 3 cups cold water + pasta sauce.Prep instructions:1. Combine one box of pronto* with 3 cups cold water in your non-stick pan (make sure water covers pasta).10 minutes.2. Cook on high for 10 minutes, stirring frequently until water is absorbed by the pasta.3. Add sauce along with your favorite ingredients. Heat through & serve.